Had your fill of binocular comets? Turns out, 2017 may have saved the best for last. The past few months has seen a steady stream of dirty snowball visitations to the inner solar system, both short term periodic and long term hyperbolic. First, let's run through the cometary roll call for the first part of the year: There's 41P Tuttle-Giacobini-Kresák, 2P/Encke, 45P Honda-Markov-Padjudašáková, C/2015 ER61 PanSTARRS and finally, the latecomer to the party, C/2017 E4 Lovejoy. It would seem that we're getting a year's worth of binocular comets right up front in the very first half. 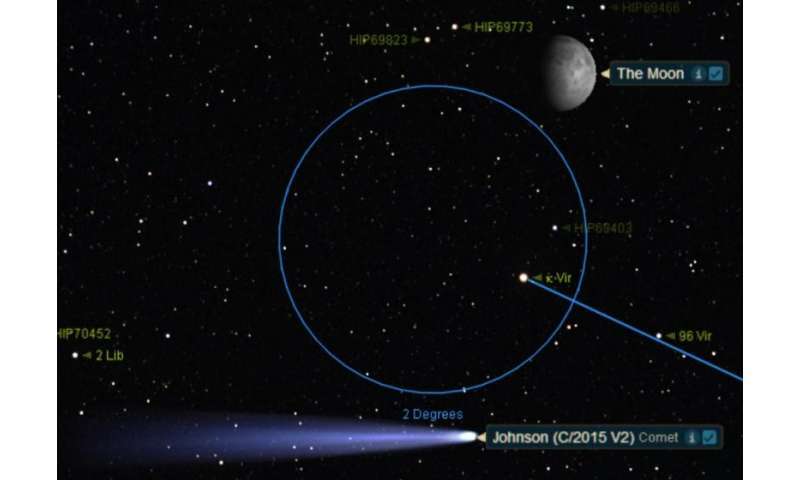 Part of what's making Comet V2 Johnson favorable is its orbit. With a high inclination of 50 degrees relative to the ecliptic, it's headed down through high northern declinations for a perihelion just outside of Mars' orbit on June 12th. Though Mars is on the opposite side of the sun this summer, we're luckily on the correct side of the sun to enjoy the cometary view. 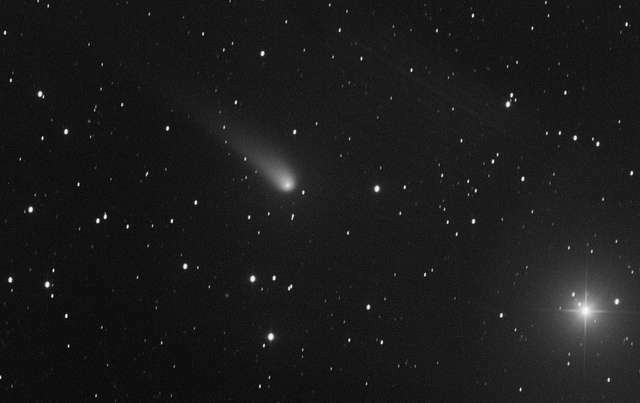 Comet V2 Johnson passed opposition a few weeks ago on April 28th, and will become an exclusively southern hemisphere object in late July as it continues the plunge southward. 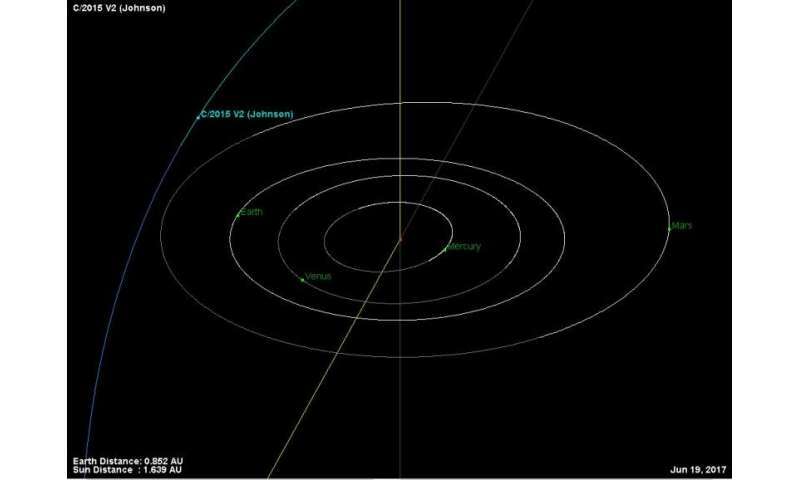 This is likely Comet V2 Johnson's first and only journey through the inner solar system, as it's on an open ended, hyperbolic orbit and is likely slated to be ejected from the solar system after its brief summer fling with the sun. This week sees Comet V2 Johnson 40 degrees above the eastern horizon in Boötes as seen from latitude 30 degrees north, one hour after sunset. 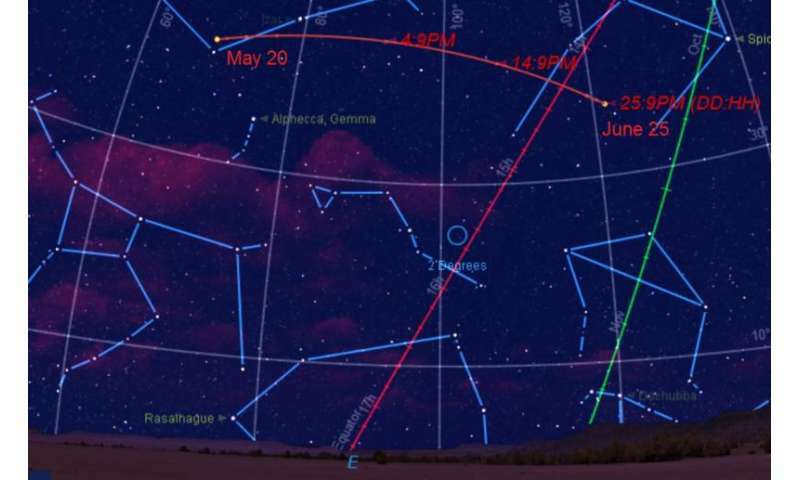 The view reaches its climax on June 6th near the comet's closest approach to the Earth, with a maximum elevation of 63 degrees from latitude 30 degrees north, one hour after sunset. Binoculars and a good finder chart are your friends hunting down a comet like V2 Johnson. We like to start our search from a nearby bright star, then slowly sweep the field with our trusty Canon 15×45 image-stabilized binoculars (hard to believe, we've had this amazing piece of astro-tech in our observing arsenal for nearly two decades now. They're so handy, picking up a pair of "old-tech" none stabilized binocs feels weird now!). An +8th magnitude comet will look like a fuzzy globular cluster which stubbornly refuses to resolve when focused. A wide-field DSLR shot should also tease V2 Johnson out of the background. It's strange to think, there are no bright comets on tap for the remainder of 2017 after V2 Johnson, though that will likely change as the year wears on. It's not an umlaut, it's a dieresis.